This chapter explores the learning dimension of the smart city and the potential for innovation through use of an early-stage social radio tool. Based on use experience with the tool, this study aims to provide an understanding of: (a) how participatory and collaborative engagement can be fostered and (b) the awareness aspect of emerging technologies. Emergence theory (e.g., emergent behaviors) and the key concepts of awareness, creativity, and innovation are used to provide a context and framework for investigation of use experience with a tool designed for learning through involvement, inclusivity, and interactivities. 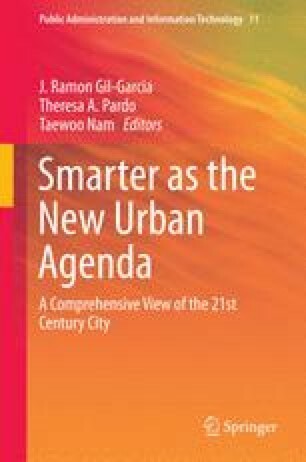 Nam and Pardo’s technology–people–institution framework for smart cities provides the basis for expanding upon and rethinking learning in the smart city—specifically, rethinking learning flows and relationships to enable interactivities and mutual learning between local government and educators/learners. A case study approach incorporating under design (e.g., a minimally viable tool) is used and multiple methods of data collection and analysis are employed in generating quantitative and qualitative findings. This work makes several contributions to the eGovernment literature by providing: (a) insight into the value of under-design approaches in understanding and assessing tools at the early development stages for eGovernment, transformational government, and lean government; (b) a framework for rethinking and innovating the learning city; and (c) an expanded way of looking at and working with learning and innovation in the smart city that may have implications for other types of eGovernment relationships (e.g., G2C, G2B, and G2G). Signet. (2014). What is emergent learning? Signet Research and Consulting. http://www.signetconsulting.com/concepts/emergent_learning.php. Accessed 10 June 2015. Violino, B. (2014). Smart cities are here today—and getting smarter: Big data, mobile, sensors, social media are already in use, but security and privacy are issues. Computerworld, 12. http://www.computerworld.com/article/2487526/emerging-technology-smart-cities-are-here-today-and-getting-smarter.html. Accessed 10 June 2015.